One of the areas in which Visio particularly shines is that of Sales Force Automation. With Visio, a rep can sit on-site with a customer, and visually spec out a system or an installation. The components in the Visio schematic can be linked to real product-data, and can be analyzed via code to generate bills-of-material and reports automatically. On MSDN, I recently uncovered “oldie but goody” demo that shows off these capabilities. 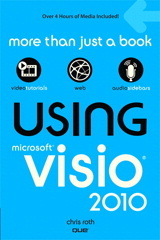 I created it for Visio 5.0, while I still worked for Visio Corp, and it still works with Visio 2003! 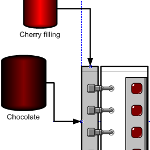 The demo illustrates how a fictitious candy-manufacturing line might be laid out. Custom shapes represent general classes of equipment, and database links behind the shapes specify real-world items. With the click of a button, a Bill of Materials, is generated in an embedded Excel spreadsheet, sitting right on the page!